Fjord Line's sleek catamaran, HSC Fjord Cat, calls right in the centre of the Norway's fifth largest city - southern Norway's popular Kristiansand. It’s not surprising so many people want to live in the cheery southern Norwegian city. Kristiansand is known for having a rich cultural life, a progressive business sector and some of the country’s best recreational opportunities on its doorstep. With more than 12,000 young students, Kristiansand is also a blooming university city with a lively nightlife. The city also boasts a number of exciting tourist attractions, with Kristiansand Zoo and Amusement Park topping the list. Fjord Line’s fast HSC Fjord Cat docks right in the centre of this idyllic southern Norwegian city. 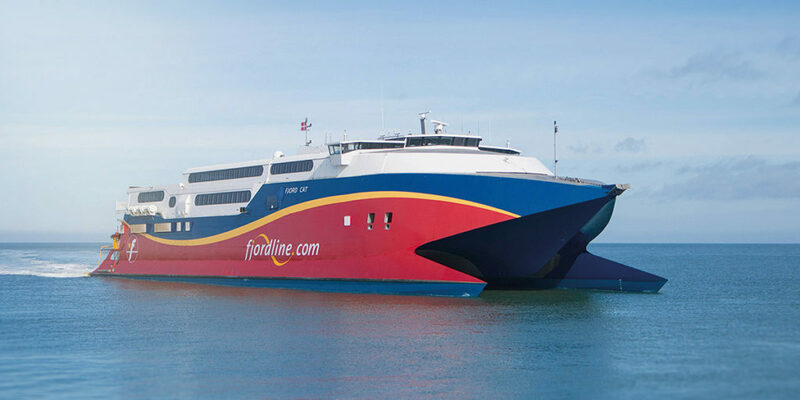 Fjord Line’s speedy HSC Fjord Cat takes you between Hirtshals and Kristiansand in just 2 hours and 15 minutes. Yes, on the 2nd floor in the departure hall. There is parking next to the terminal with a maximum stay of 30 minutes. Short-term parking is available across the road (for a fee). For long-term parking, we recommend car parks in the city centre. Vending machines on the 1st floor of the departure hall. No. There is an ATM in the bus station around 50 metres from the terminal building. The ticket office accepts NOK, DKK and EUR. Coins are only accepted in NOK. ¬Accepted cards are Norwegian debit cards, VISA and MasterCard. Unfortunately we do not accept Visa Electron. It’s not easy to pick out just a handful of recommendations for Kristiansand as the city has so much to offer! Here are our top five tips for anyone planning to visit the cheerful Southern Norway city. Posebyen is Kristiansand’s oldest district, and it’s also the only part that was not completely destroyed by the ravages of the city fire in 1882. Posebyen is made up of charming wooden houses, all painted in white and visitors are invited to meander through centuries of southern Norway’s history. Wandering round Posebyen is like finding yourself in an outdoor museum – except that you’ll find entirely normal people living here. During the summer months, there’s also an outdoor market in Posebyen almost every Saturday. Here we can guarantee you’ll find a summer atmosphere like no other! Kristiansand is full of recreational areas, and not far from the city centre you’ll find the gorgeous Ravnedalen nature park. Ravnedalen combines culture and nature in a captivating way: the nature park is just as renowned for its flora and fauna as for its wonderful outdoor stage the broad range of artists that play here. You’ll also find the welcoming “Café Generalen”, serving recipes dating back to around 100 years ago. And bear in mind that they also serve an absolutely delicious burger here. Setedalsbanen is a narrow gauge preserved railway line which uses 100-year-old steam locomotives and carriages. The line was opened in 1896, but closed in 1962. Taking a trip on Setesdalsbanen is like taking a trip a hundred years into the past. Come along and enjoy the venerable station buildings, stylish teak carriages, old locomotives and the smell of burning coal. The line follows an 8-km route between Grovane and Røyknes stations. Along the entire stretch, you’ll have the chance to swim, fish, cycle and just enjoy the great outdoors. Centrally-located Odderøya was originally a military base, but is now a very popular recreation ground. In addition to exploring the natural surroundings with signposted trails, the area also offers a fantastic view over the eastern port, Christiansholm fortress and marina. In summer, there are regular concerts at two of the country’s amphitheatres, Odderøya Amfi and Bendiktsbukta. On the eastern side of the island there are some excellent bathing spots, as well as a hiking trail adapted for disabled visitors. This small outdoor museum is a mini town showing districts of houses from old Kristiansand. The museum’s oldest building is Nomelandsloftet, which dates back to 1585. Vesterveien 4 was originally built to house the National Archives in 1935. The building is best known as being the Gestapo’s headquarters in southern Norway from 1942 to 1945, and for a long time the house was known as “The House of Horror”. 367 Norwegian men and women were severely tortured here during the war, many of whom died as a result. The museum is therefore dedicated to this dark period of our history. The building’s cellar has now been restored to the condition it was in during the war and this area is also open to the public. Gimle is often referred to as one of the country’s most beautiful manors. The house was built as a summer residence for the wealthy merchant Bernt Holm circa 1800, but the farm has been left untouched since the last owner Titti Arenfeldt Omdal passed away in 1982. Titti was a direct descendant of the original owner and the manor had thus belonged to the family ever since it was built. Gimle farm is open in June, July and August, but groups are received all year round as long as you book in advance. Follow the E39 and signs to Denmark. Bus and train stations 50 metres from the terminal building. For timetable information, see www.akt.no and www.nsb.no. The taxi rank is around 50 metres from the ferry terminal, by the bus station.